The next logical step up from kits, brewing from malt extract allows you more control over the beer style, colour, flavour and bitterness. There are many recipes available both on the web and in brewing books, and for your first brew I would recommend you follow one of them rather than trying to work out quantities of grains and malt extract yourself. Once you develop your skills, you can start looking at formulating your own recipes. You will need all the equipment for kit brewing, i.e. all the gear to ferment and bottle or keg your brew, and in addition, you will need some kind of boiler. My DIY stainless steel electric boiler shown above is just one option - have a look in the 'Equipment' section for more ideas. 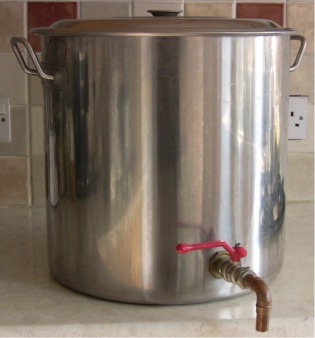 You can get away with a boiler of 2 - 3 gallons capacity by boiling in batches or boiling the extract with part of the water and adding the rest cold. The problem is that boiling in batches takes much longer and using only part of the water increases the concentration of wort in the boiler, which means you won't extract the bitterness from the hops as efficiently. For these reasons you should aim (if you want to produce many batches by this method) for a boiler of at least 6 gallons capacity if you're making 5 gallon batches of beer. The extra capacity allows for boil over and evaporation, and you won't have to buy a new one if you decide to go all-grain in the future. To cool the wort quickly after boiling, some kind of chiller is required, however if you don't want to go that far, standing the fermenter in a bath of cold water will do the job (though not as quickly).